Jean-Philippe Rameau is one of the most admired composers of the 18th century. That is partly due to his operatic output which is original and always of the highest quality. Another reason is his orchestration. Whereas after his death his oeuvre was soon overshadowed by Italian-influenced opera he was rediscovered in the 19th century. Hector Berlioz admired him and Claude Debussy even adored him. The latter was one of the editors of the first complete edition of his oeuvre which was started in the 19th century by Camille Saint-Saëns. Other composers involved in the project were Vincent d'Indy and Paul Dukas. In 1903 a modern premiere of Castor et Pollux took place. The commemoration of his death in 2014 has given interest in his music a boost, but even before that a number of his operas - albeit mostly a handful, performed over and over again - appeared regularly in the calendars of opera houses. The present disc offers a cross-section of his operatic output, and we meet again some of his most famous creations, such as Les Indes Galantes, Platée and Dardanus. In comparison Naïs and Zoroastre are far lesser known. Some time ago I reviewed another disc with excerpts from Rameau operas, with the soprano Sabine Devieilhe and Les Ambassadeurs. It was one of my discs of the year, but I am sure that the present disc is not going to appear in my list next December. There can be little doubt about the qualities of the ensemble MusicAeterna which Teodor Currentzis has built up in as remote a place as Perm in the eastern part of Russia. It is certainly a part of the world where I wouldn't have expected to find a period instrument ensemble which focuses on the performance of baroque and classical repertoire. One of the assets of this recording is also the soprano Nadine Koutcher who has a really beautiful and pure voice which is perfectly suited to this repertoire. That said this disc leaves me unsatisfied for several reasons. The first is the way the programme has been put together. I can't see any logic in the arrangement of the extracts from the various operas. Pieces from a single opera, such as Les Indes Galantes, are distributed over the whole programme, and the first piece we hear, is the chaconne which ends the opera, immediately followed by the Ballet des fleurs from the 3e Entrée. Secondly and more importantly, the palette of colours which is a feature of Rameau's orchestral score is impressively displayed by Les Ambassadeurs but doesn't really come off here. That is partly due to the difference in the line-up of the two ensembles: Les Ambassadeurs make use of the string instruments which were still common in Rameau's time, including haute-contre and taille; MusicAeterna has the conventional line up with violins, violas and cellos. However, that is not the main reason. Often its playing lacks subtlety, especially when it plays forte. That effect is enhanced by the fact that the orchestra is rather large, probably considerably larger than what Rameau had at his disposal: 22 violins, 9 violas, 6 cellos and 4 double basses plus wind and continuo. There are also some special effects, such as the long held chord which leads to the recitative and aria from Platée (track 10), played forte, with many dissonants, and ending with a crescendo. Ending an instrumental piece with a crescendo is one of the features of this disc, and is quite stereotypical. The Entrée from Les Boréades (track 3) is played in an extremely slow tempo. In some slower episodes I miss a clear exposition of the dance rhythm, for instance in the opening section from the Premier & Deuxième Tambourin from Dardanus (track 17). One of the major problems of this recording is that Currentzis attempts to do too much. The dynamic contrasts are exaggerated, the caricatural aspects of Platée are terribly overdone (Aux langueurs d'Apollon) and so are the effects in La Poule. The latter is from a set of six Concerts en sextuor, a collection of anonymous arrangements of Rameau's Pièces de clavecin en concert with an additional concert after harpsichord pieces from his oeuvre. La Poule is one of the latter, and in his liner-notes Benoît Dratwicki states that this effects of the piece are well suited to strings. However, here oboes and bassoons also participate. There is no fundamental objection to that, but the performance with an orchestra is highly questionable, both stylistically and from a historical angle. In his notes Teodor Currentzis states: "I do not wish to produce the most "authentic" baroque sound. I wish to go further and meet parts of myself that I do not know yet". In that case wouldn't it be better to go to a psychologist? Currentzis's approach is of no use to me, and I suspect I'm not alone in this. 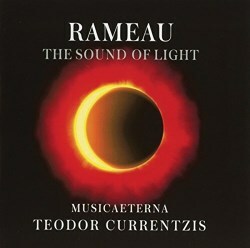 I want to hear Rameau's music as he intended it to be played. There has been much praise for this ensemble and its conductor, and especially their recordings of some Mozart operas have earned great enthusiasm. I haven't heard them, so I was curious to listen to this disc and find out whether the excitement was justified. Having listened to it I wonder what all the fuss is about. As I said before the qualities of the orchestra are not in doubt but these interpretations leave me utterly unconvinced. Nadine Koutcher is the only reason that I may return to this disc once in a while.